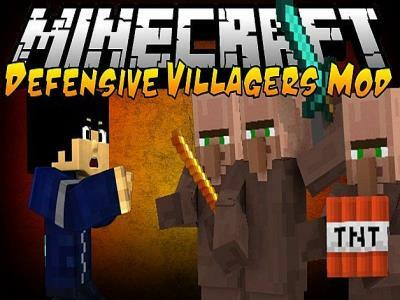 The Defensive Villagers mod addresses the problem of town depopulation by way of hostile mob attacks. It does this by replacing the standard, helpless villagers with armed and ready militiamen. A Hostile Mod for a Hostile World One of the charming aspects about Minecraft is how a player can find a village and become a part of the way it functions. Building a house on the outskirts of a village is a great way to help the game’s world feel a little less hostile. Unfortunately, it is a hostile world and it is common for whole populations of villagers to be completely wiped out in as little as a single night! This mod give them a fighting chance by replacing the standard “testificate” models with those resembling player models, decked out with full armor and weapons. The Defensive Villagers mod for Minecraft has several tiers of people. From unarmed inhabitants to those wielding full diamond sets, these townsfolk are ready for the dangers of nightfall. They will attack hostile mobs on sight, as well as those trying to pound down doors. Should the player be interested in the idea of raiding villages, the new NPCs will also attack them! On being killed by the player, they will drop armor and weapons from the item set they are wearing. This can provide a new means of collecting high tier, costly armaments for players more interested in exploring the surface world than climbing down into the expansive cave systems. Retaining even the trade functions, all of the standard features of villagers are preserved. This mod gives villagers a fighting chance of not being eradicated by zombie sieges. It also goes a long way to making villagers feel more familiar, which can be an issue for some players.